How to book a great limo for weddings in Gainesville. 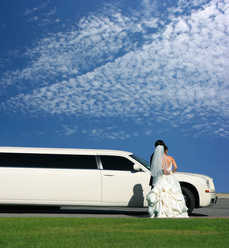 Make your big day special and stress free with luxurious limo service. We can help you arrive at the aisle in style, roll into your reception with a splash and hurry off on your honeymoon after the night ends. 1. Love and limos! You only get married once…hopefully. Make it an extra special day by arriving at your wedding in a luxurious limo. Our classic limousines will turn your wedding day into a fairytale experience. 2. Glam for the whole family. Extended family and friends will abound on your wedding day. With limos and party buses, you can ensure that all your guests arrive safely, promptly and in style to your big day. Don’t stress out over last minute phone calls and lost relatives! 3. Seriously, it’s YOUR special day! Avoid stress and hassle on your wedding day by opting for limousine transport to and from the wedding venue. Wedding jitters will fade away and excitement will replace them when you coast in luxury to the aisle. 4. Hurry to the Honeymoon. What better way to kick-off alone time with your new partner than luxurious, private transport to your hotel or the airport. You have celebrated with those you love, now celebrate privately together. We can arrange champagne in the car and great ambience. End your new nuptials with a bang. 1. Use our free quote form to the right to give us your information. 2. A friendly agent will contact you promptly to hammer out the details. We can answer any questions and provide you with all the information you need to get started.